Push piston lever to its lowest position. Select the desired syringe. To achieve smooth operation in the dispenser, test syringe by moving syringe piston up and down several times. Place the nozzle of syringe into the liquid to be dispensed. Wipe the nozzle of syringe or tip with a tissue. 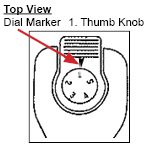 If syringe has been fully filled, the thumb knob should be depressed once, and the liquid expelled before using the dispenser. The dispenser will then deliver the number of dispenses in accordance with the table attached to the side of the handle. If the syringe is only partially filled, the dispenser can be used by pressing the thumb knob until it reaches the black line at the end of the syringe. Note: To maintain its accuracy, do not dispense liquid after the piston has passed the black line. Place nozzle or tip of syringe so it is touching the inside wall of the receptacle. Depress the thumb knob as far as it will go. The desired volume of liquid will then be delivered into the receptacle. After dispensing, the liquid remaining in the syringe can be ejected by pushing the piston lever downwards.